Thhe platypus (Ornithorhynchus anatinus) is an egg-laying mammal that lives in the rivers and waterways on the eastern side of Australia, as north as Queensland and including Tasmania. When the platypus was first seen by Europeans in 1798, a pelt and sketch were sent back to Great Britain by Captain John Hunter, the second Governor of New South Wales. British scientists’ initially thought it was a hoax. George Shaw, who produced the first description of the animal in the Naturalist’s Miscellany in 1799, stated it was impossible not to entertain doubts as to its genuine nature, and Robert Knox believed it might have been produced by some Asian taxidermist. It was thought that somebody had sewn a duck’s beak onto the body of a beaver-like animal. Shaw even took a pair of scissors to the dried skin to check for stitches. The platypus is smaller than most people think, males are about 50 cm long and weigh about 1.5 kg and females are smaller, usually about 40 cm long and weighing 1 kg. The platypus bill is very sensitive, and is soft, like wet rubber which is used to locate food. The platypus’s body is covered in thick, dark brown fur and is flat and streamlined. It has a broad, flat tail with short, stout legs and webbed front feet well suited to its life in the water. Until the early 20th century, it was hunted for its fur, but it is now protected throughout its range. Although captive breeding programs have had only limited success and the platypus is vulnerable to the effects of pollution, it is not under any immediate threat. The platypus has no teeth, and stores its food in cheek pouches to eat on the surface. It chews its food between horny grinding plates and ridges on its upper and lower jaws before swallowing. 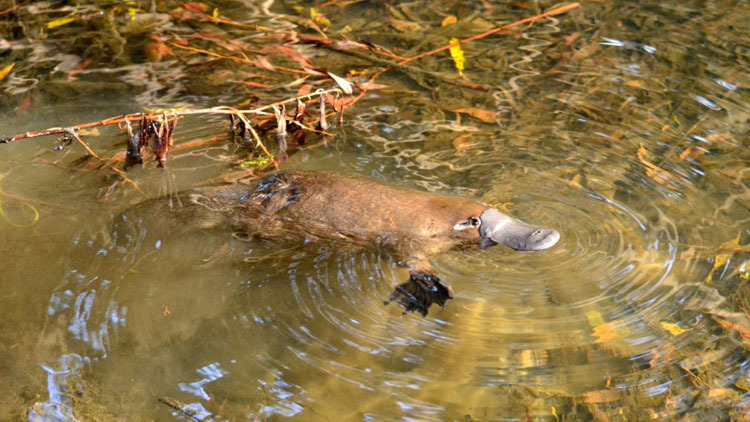 Platypus can stay underwater for up to 10 minutes. When swimming, the platypus moves itself with its front feet and uses its back feet for steering and as brakes. Water doesn’t get into the platypus’s thick fur, and it swims with its eyes, ears and nostrils shut. The Australian Museum has more information on the wonderful platypus.